Faceball 2000 is a first-person maze shooter that was only released in Japan. Cyberscape mode consists of 70 levels and the objective is to locate the exit against a time limit. 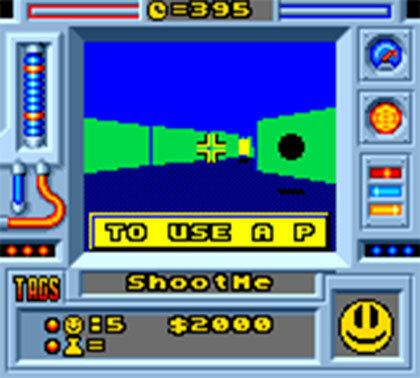 The gameplay involves shooting enemies, finding keys, touching floor buttons to open secret doors, and collecting coins to add to your score (each $1000 earns you a life too). Unfortunately, it's very slow with a choppy frame-rate which makes turning or avoiding projectiles an exercise in frustration; it also means that lining up shots is harder than it needs to be thanks to the severe over/under-steer created by the low FPS. The action takes place inside a small window (obviously to increase the frames-per-second), but the already tiny Game Gear screen results in you having to squint to recognise whether a dot in the distance is an enemy or part of the scenery! Likewise, the poor draw distance takes away much of the strategy, as most of the time you'll have no choice but to wander recklessly until an enemy (or often a dead end) suddenly appears. One neat feature is that the difficulty you select dictates your starting level; this is a great idea for allowing players to roughly continue their progress at a later date. Another thing I like is how the game continually adds new mechanics, power-ups and enemies to keep things fresh. Truth be told though, these are the only real positives and the more you progress the more slowdown rears its ugly head. Arena is a deathmatch mode (first to ten wins) with 15 stage types and a set number of enemies; it's mildly entertaining, but it suffers from the same problems listed above. Still, there is some fun to be had if you link two Game Gear's together for a battle. 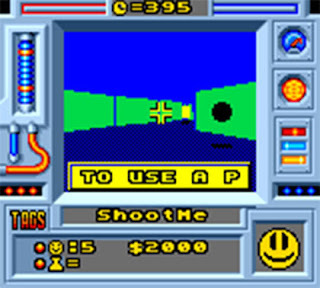 Faceball 2000 is a brave, yet ill-advised attempt to bring a first-person shooter to Sega's under-powered Game Gear, and the results are pretty much as you'd expect. The handheld simply can't handle what's being thrown at it and all you're left with is a barely playable game that really hasn't aged well. Random trivia: This is a sequel to a 1987 Atari ST game called Midi Maze.